In this post, we examined 5 of the best-selling spindle sanders. These sanding tools, sometimes called oscillating spindle sanders, are machines in which the sanding drum protrudes from a table top. The sander rotates as well as moves up and down. It is primarily used for sanding curves (Source). The sanding drum of these machines sticks up from the top of a table or flat surface. An abrasive sleeve is placed over the drum based on whatever grit you need. The drum spins and goes up and down to facilitate sanding. While there are many tools you can use for sanding projects, experts say if you need to sand curves and even circles, the spindle sander is a must have in your woodworking shop. While it might not be a tool you use every day, you’ll appreciate it when you do need it (Source). In this section, we’ll take a deeper look at these five best-sellers. The Powertec OS1400 is a 14” oscillating machine that allows you to sand contours, arcs, circles and other irregular shapes. This machine features 30 oscillations per minute to reduce the heat caused by friction, which can damage the wood. Also, this machine will allow you to sand metal, although users say you will burn through drums quickly. Lastly, this is a fixed block machine, which means you’ll have to use an angle block if you need tilt (Source). 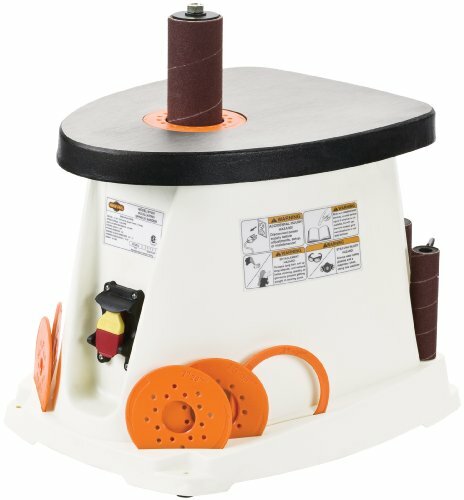 The Delta Woodworking 31-483 is a heavy duty bench spindle sanding machine that features a 1/2 HP motor and has storage on board for the tool’s accessories. Five interchangeable spindles and 29 oscillations per minute are also standout features. Lastly, this machine comes with a 5-year warranty. Next is the Triton TSPS450, which features a 450-watt motor and 58 oscillations per minute. This unit comes with six sanding sleeves and matching rubber drums. As with the previous machine, this too comes with onboard accessory storage. The Shop Fox is a 1/2 HP sander that’s CSA certified. This machine produces 58 oscillations per minute and comes with six spindle sizes for added versatility. A built-in dust port helps keep waste to a minimum, and a locking power switch keeps unauthorized users from using the machine. This model is sold by a few companies under different names, but users seem to agree it’s a solid machine that’s worth the price. Last up is the WEN 6510. This machine features a 1/2 HP, 3.5 amp motor, which provides 58 oscillations per minute. It comes with six 80 grit sleeves in a variety of sizes. Also, like the other machines, this one comes with onboard storage. And, like the previous machine, this too comes with a dust collection port that can be attached to a shop-vac to eliminate waste. Lastly, this machine comes with a 5-year warranty. This spindle sander offered by WEN is well-made, efficient, and an excellent choice for sanding curves, arcs, and other shapes. Users love the smooth oscillating action, but some do note that it’s noisy. 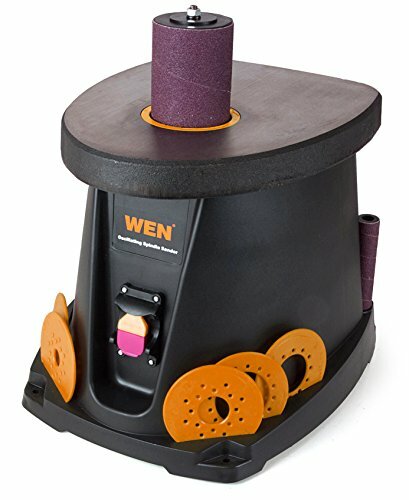 The WEN sanding machine features a 3.5-amp motor, a weight of 35 pounds, a cast iron worktable, a six 80-grit sleeves and five rubber drums for various curvatures. Another great thing about this product is that it has onboard storage, which is perfect for keeping your accessories in one place. What’s more, it has a 1.5” dust collection port so that you can hook it up to dust extraction. You also have a 2-year warranty. As a whole, users are satisfied with the quality, performance, and functionality of the WEB spindle sander. A reviewer comments that the package includes everything you need to start sanding and that it’s light but powerful enough to get the job done. He highly recommends it as one of the best spindle sanders. Another buyer mentions that the unit is far more reliable and useful than he expected and that it’s well-built. He adds that he loves the cast iron worktable, but notices that the finish is rough. A purchaser shares that the motor runs well and that it’s holding up after months of use. However, a couple of customers have noted that the worktable is not completely flat and that the machine is too loud. If you are wondering what to use to smooth edges, you might take a look at this oscillating sander offered by Shop Fox. Users love the quality and the weight of the unit, but some do note that it’s loud. The Shop Fox sanding machine features a single phase motor, CSA certified, a cast iron table measuring 15” x 11-1/2”, a weight of 30 pounds, six sleeves, a drum length of 4.5”, and five drum diameters. Another great thing about this product is that it has a locking power switch to prevent unauthorized access in addition to the onboard storage space. What’s more, there is a 1.5” dust port so that you can connect it to a dust extractor. A reviewer comments that he was skeptical at first, but the sander turned out to be well-engineered and efficient. He adds that it oscillates fast and that it runs smoothly. Another buyer observes that the unit is well-balanced and so light that you can move it around without sweating. A purchaser also shares that the product arrived well-packed and that the instructions are sufficient. He also states that the motor is powerful enough and that the dust collector is a nice bonus. However, a few customers have complained that they received a defective unit, which didn’t work right out of the box or that the motor died in a couple of days. This oscillating sanding machine offered by Triton is convenient, easy to move around, and perfect for sanding irregular shapes. Users love the quality and the price, but some do note that they don’t like the table inserts. The Triton spindle sander features a 3.5-amp motor, a11 ½” x 14 ½” table, a rotating & oscillating action, which is excellent for improving speed, precision, and efficiency, and a weight of 33 pounds. Another great thing about this product is that it has six sanding sleeves with rubber drums in addition to onboard storage space to keep your accessories in one place. As a whole, purchasers are impressed with the design and performance of the product, and they highly recommend it as one of the best spindle sanders available. Reviewers don’t have any major complaints. A buyer comments that it’s easy to change the sleeves and that the drum doesn’t slip at all. He adds that there is plenty of space to store all the accessories and that the motor is powerful enough for light –medium-duty jobs. Another customer states that the sander seems solid and that he has used it for weeks with no problems or complaints. He also observes that the motor runs quietly and that the dust collection feature is nice. If you’re looking for a heavy-duty machine to sand edges and curves, you might take a looking at this oscillating bench spindle sander offered by Delta. Users love the onboard place for storing accessories, but some do note that it’s expensive. 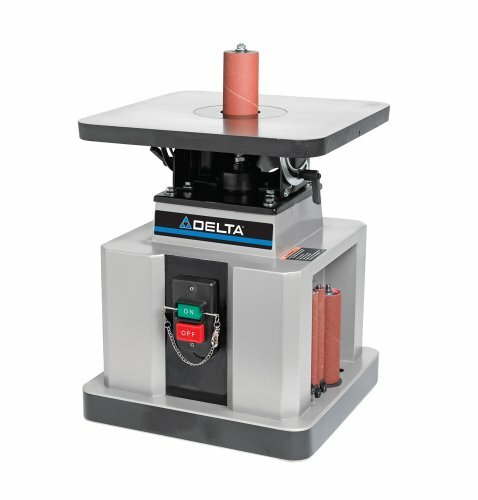 The Delta Woodworking sanding unit features a single phase 115V motor, fully enclosed steel frame to decrease vibrations, a 14-3/4”- x 14-3/4” cast iron table, and five interchangeable threaded spindles. Another great thing about this unit is that it has a dust port and twin locking handles for stability. What’s more, it has large bevel scale for accuracy and a 5-year warranty. In general, users are immensely satisfied with the design, performance, and durability of the Delta heavy-duty oscillating sander, and they don’t have any major complaints. A reviewer comments that the product runs very quietly and that it has plenty of power to do all kinds of jobs. He adds that he likes ¼” spindle because its handy for tight corners. Another purchaser states that the unit doesn’t require any assembly – take it out of the box and you’re ready to go. He also shares that it’s solid and stable and that the exhaust ports work extremely well. He highly recommends to anyone looking for heavy-duty oscillating spindle sanders. However, a couple of customers have noted that they received a damaged unit due to the way it was packed and shipped. Are you tired of sanding curves and edges by hand? Then you might try this oscillating spindle sander offered by Powertec. Users love the design and the price, but some do note that it’s too noisy. 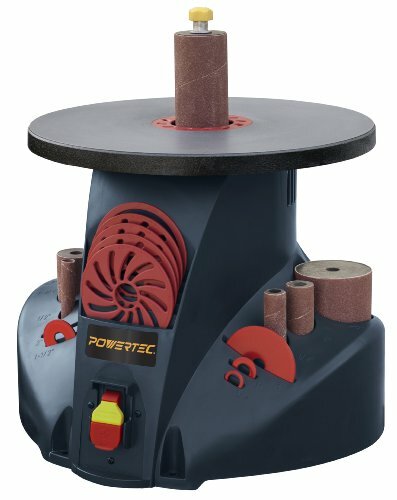 The Powertec sanding unit features a 2.6-amp motor, a 5/8” stroke, a 14” table, and a 4.5” drum length. Another great thing about this product is that it has a dust port so that you don’t have to worry about making a mess in your workshop. What’s more, you have an onboard storage place for keeping the drums, inserts, and washers in one place. In addition to this, the package includes six drums of different sizes. A reviewer comments that he was surprised by the performance and design of the Powertec machine and that it’s a piece of cake to change the spindles. He adds that he used it to sand walnut and encountered no problems. Another buyer observes that it’s perfect for small jobs even though the base is flimsy. He also mentions that the machine was packed upside down, but there was no damage. A user shares that he is satisfied with his purchase and that it performs flawlessly. However, a couple of customers have noted that the base is plastic and that the motor and the table are too heavy for it, hence it cracks easily. The creator asks ‘when you look at a piece of wood furniture what is the first thing you notice?’ He says, chances are its the design, or maybe the shade, but one thing you almost certainly don’t notice is the quality of the sanding job unless of course it had been done badly. In this video, he’ll provide you with some tips to assist you to get great results with your wood sanding projects. to start off. They talk about rigid power sanding versus hand, and how powered options remove material a lot faster than sanding by hand. Some power sanders are perfect for getting the first stages of sanding done fast but even the finest power sanding tools have a tendency to leave some scratches behind- this might be completely appropriate for rough work. But it isn’t a great thing for fine furnishings, crafts or cabinetry to get rid of all visible, so scratches some hand sanding is generally required, particularly on those finer woodwork jobs. Knowing that, they check out some portable rigid power sanders. Typically the most popular models are belt, orbital, random orbital, detail or finishing options. 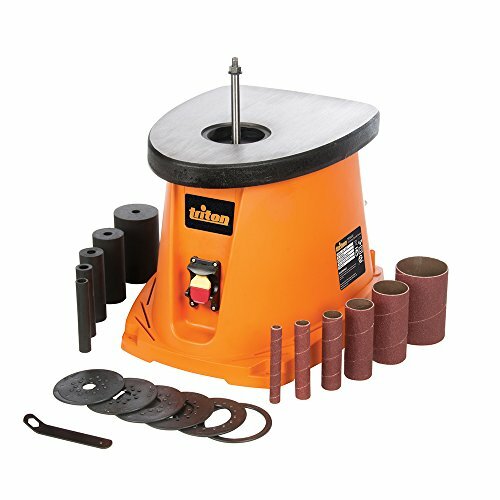 A belt sander like the one in the video has a sanding belt that operates in one direction. This is a hefty, strong tool created to swiftly remove a lot of wood from a large flat surface. This is not the sort of thing you would like for finish. 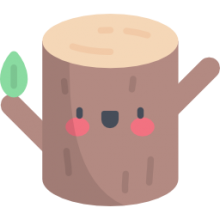 You move it along with the grain of the wood from left to right- you don’t have to press down hard. Orbital sanders and random orbit sanders are more for general purpose uses. On the sanding surface, an orbital sander moves in a circular pattern or an orbit. An orbit stander is more preferable for rough work and for finish work since it will tend to leave swirls or gouges behind if you do not move it uniformly along the grain of the wood. A random orbit sander moves in a circular pattern and backwards and forwards to reduce those swirl patterns. So while it’s helpful for rough sanding, you may also apply it some finer specimens but, like They said before, you will most likely still need to do some hand sanding on fine woodworking. A finishing sander is fantastic for sanding odd shapes and the nooks and crannies, where a larger sander won’t fit. These tools are frequently used for wood crafts- you won’t want to use too much pressure or you may wind up with an uneven surface- apply light even pressure and use long, even strokes. Allow the moving parts of the sander perform the work. Keep in mind you are sanding the wood and don’t need to scrub it. If you draw some light pencil lines on the surface, it’s going to assist you in estimating how well you’re progressing. You need to keep your surfaces clean and dust free as possible when you are employing a power sander, simply because the sander will not work as effectively. Should it be continuously riding over a layer of dust and grit, when the debris goes into the vacuum cleaner or a dust bag, the sander will work more effectively. Additionally, you will see a lot less dust flying around the working area. You’ll still Need to put on eye protection and a dust mask while sanding. And if you have a dust bag empty It often keeps the sander performing at peak efficiency at the minimum empty. Make sure you use a non-tipping surface. You wouldn’t want the wood sliding around- that may result in injury or project damage, as well as frustration. Placing the wood on a non-slip pad like the one in the video supports the wood nice and steady with no damage your project. Now no doubt you’ve observed the sandpaper power, sanding belts and pads and discs can be found in different grit materials and grit numbers. Aluminum oxide is easily the most frequently preferred grit material for woodworking. Garnet paper is yet another option, but it’s not quite as well-liked as silicon. Carbide is more popular for drywall and metal. Ceramic abrasives are generally coarse and are often featured on power Sanding accessories. The grit number refers back to the quantity of abrasive particles per inch of sandpaper- the larger the grit number. The finer, the grit, for instance, 80 grit sandpaper, is comparatively coarse while 220 grit is a lot finer. When sanding, you usually want to progress from coarse to fine grit sandpaper or from lower numbers to greater ones.